Being Frugal and Making It Work: Slumber Party Birthday Cake Ideas! My daughter will be turning 9 years old next month and will be having her first ever slumber party! She's very excited about her party and having her friends sleepover. Of course, I want to make her first slumber party extra special. I think I have all the other details figured out, my only dilemma is choosing the perfect cake. 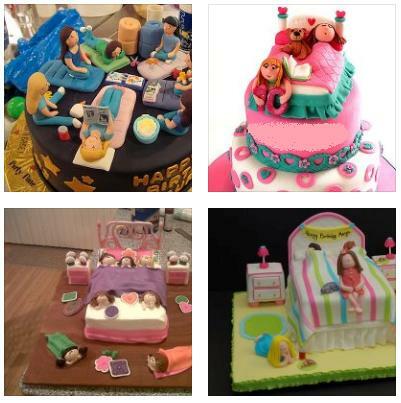 Which slumber party cake is your favorite? I love Number two. That was my best friend and I almost every weekend. are you making it yourself? That is amazing!! I have never been able to do anything near that good with fondant. I love the 2 on the left :D are u making it your self or ordering it? Those are very cute, great ideas! I like the bottom left, they all are adorable.. Good Luck on the party and Happy Belated Birthday to the birthday Gal!